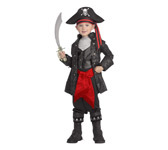 Charming Captain Honor pirate costume. Jacket with attached vest, pants with attached boot tops, hat, waist sash. Sizes: TODDLER (size: 2-4,for 1-2 years old), SMALL (size: 4-6,for 3-4 years old), MEDIUM (size: 8-10,for 5-7 years old). Costume is designed to be readily recognized as a pirate outfit. Color of the costume is black. Perfectly fitting pirate costumes are our priority. Please click on: RUBIE'S COSTUMES SIZING CHART for sizing information.